Yoga Tues/Thurs at 5pm. Adult Bell Choir Wed at 5:00pm Youth Bell Choir Wed 6pm and Choir at 7pm. Tuesday/Thursday, April 16 & 18. 5pm Yoga. If you would like to bring a cereal donation, we donate to Christian Social Services. The yoga classes will end on August 25. Easter Lily Dedication. If you would like to have a loved one/friend remembered on Easter Sunday, April 21, contact the church (606-784-4836) to let us know. Please order a white lily with white wrapper and white ribbon from your florist to be delivered by Thursday, April 18 - 1pm. Your dedication will appear in the Easter Sunday bulletin (deadline Wednesday, April 17). Flowers may be picked up after the worship service. Thursday, April 18 Maundy Thursday Dinner 6pm with soup and sandwiches; Taizé Service 7pm. The congregation is requested to bring soup, sandwiches and/or dessert. We will be jointed by Faith Presbyterian and First Baptist Church. 9:45 am Adult Sunday School facilitated by Dr. Alana Scott. The DVD series by Luke Timothy Johnson is entitled "Mystical Tradition: Judaism, Christianity, and Islam." 10:45am Worship Service with Rev. Don Chase brings the message "Resurrected Not Rescued." Wednesday, April 24 6:00-6:45pm Book Study: The Universal Christ by Richard Rohr. Meet in the Helphinestine Library. Men's Fellowship TBA. Meet at McDonalds. Contact Brent Rogers. Thursday, May 2. FCC Choral Scholars Benefit Dinner and Concert. Pork BBQ, Cole Slaw, and chips will be served at 6pm and the concert will begin at 7pm. We are honoring our Morehead State University choir interns. ​Sunday, May 5 12pm First Sunday Lunch Mexican Dinner (Cinco De Mayo). The congregation is requested to bring mexican dishes. Gateway Homeless Basket. Items for the basket for those transitioning to a permanent home from the Gateway Homeless Shelter are due always at First Sunday Lunch (January-October). Outreach Committee thanks you! Have you registered with AmazonSmile and changed over your Kroger card? This is an easy way to add to our Outreach funds. Contact our office for a form to be emailed/mailed to you. Direct Deposit Is here! Contact the church office at 606-784-4836 or click on this _Direct deposit link (Go to file:authorization_agreement_for_direct_debit_8.5x11). ​We are located at 227 East Main Street in Morehead, KY across from La Finca Mexican Restaurant and beside the Rowan County Arts Center. Our parking lot is in the rear of the church. We are glad you’re looking us up on the internet! But we hope you come visit us in Morehead so we can introduce ourselves personally. If you do, you’ll find a church that loves God and one another, and would love to have you become part of our community. Here’s a brief look at what you can expect when you come to worship with us. 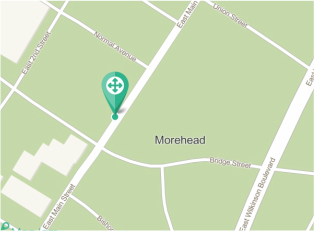 You will find us on Main Street in downtown Morehead; there’s a map above for clarification. Our parking is behind the church. We are across the street from LaFinca Mexican Restaurant. On the other side acros the street is the old Rowan County Courthouse, now housing the Rowan County Arts Center. What time does worship service start and how long is it? Our morning worship starts at 10:45; odd, we know, but it almost always gets us out before noon! Our Adult Sunday School begins at 9:45am. Our current study is Days of Awe and Wonder by Marcus Borg. You can get a copy of the book to read along, or just join in the Discussion. The leader of our class is Dr. Alana Scott. Our service is a combination of traditional worship and casual gathering. Our music is different from week to week – you might hear handbells, harp, tuba, solos, choir, trumpet, pipe organ, or jazz sax. You maY get to listen in on a children’s moment we offer twice a month. The sermons are Biblically based looks at contemporary life. When you come, you can count on being offered communion. Every week we celebrate the death, burial and resurrection of Jesus by recreating the meal shared with his disciples before his crucifixion. The bread and juice, representing his body and blood, are offered to all believers regardless of their background or church membership. Our deacons serve communion to everyone as they sit in the pews, so if you’d rather not partake it’s not a problem -- just pass the tray to the next person. Some of our members are old-school and show up in their “Sunday best” every week. Others of us feel fine showing up in pants and a sweater, just like any other “business casual” day of the week. Our college students have been known to be here in jeans.You decide what’s most comfortable for you, and we’ll be glad to see you no matter what you’re wearing. If your child is three years old or younger, you can take her to our nursery. The nursery is located just below the sanctuary, and you can be sure that the environment is safe and stimulating. If your child is four years or older, he or she will go upstairs for Children's Church for individualized attention to the gospel and spiritual nourishment on their level. What does the symbol of the chalice mean? The Chalice, with the St. Andrews Cross embedded in its left side, is the appropriate symbol for the Christian Church (Disciples of Christ). The Chalice speaks clearly of the centrality of Communion in the worship of the Christian Church; and St. Andrews Cross reminds us of our denominational heritage with Scotland through Thomas & Alexander Campbell. The flag of Scotland bears the white St. Andrews Cross on a field of blue. Andrew, the brother of Peter, spread Christianity throughout Asia Minor & Greece. It is said that Andrew was put to death by Romans in Greece by being nailed to a Cross of this shape. Peter is associated with Scotland because his bones were brought to Pictish, Scotland, in 733. The town of Pictish later became known as St. Andrews, & became the religious center & renowned pilgrimage site in Scotland. Call the church office and talk with Barbara, our church administrator (8:30 – 1, Monday through Thursday, 606.784.4836). Ask any one of the many folks in town who call our church home. We’re looking forward to meeting you!